Cucumbers are a refreshing fruit that you can enjoy raw with salads, sandwiches or on their own. Very low in calories, cucumbers are fat and cholesterol free. However, some people experience gastrointestinal distress from some varieties of cucumbers because of a bitter substance called cucurbitacin. The more bitterness your cucumber contains, the more likely you will experience the digestive discomfort known as the burp. By choosing the right cucumber seeds and growing cucumbers differently, you can control some of the bitterness. Visit your gardening store or shop online to find the right cucumber seeds, or use seeds from a grown cucumber. Certain types of cucumber seeds have less cucurbitacin and taste less bitter. Purchase new hybrid varieties of cucumber seeds. These seeds are often labeled as "burpless." These hybrids tend to be much less bitter. Use the Asian varieties of the burpless hybrid seeds instead of American types if available. According to research published in 2000 in "Hort Technology," the Asian cucumbers are significantly less "burpy" than any type of American cucumbers. American cucumbers had a mean rating of 3.0 to 3.5 on the burpiness scale, while Asian cucumbers had a mean rating of 0.5 to 1.0 on the scale. Plant your cucumbers in a space with ample sunlight. Avoid cool or shaded locations. Apply a layer of mulch, such as bark or straw, to help conserve moisture and keep away weeds. Provide uniform moisture to your cucumber plants. 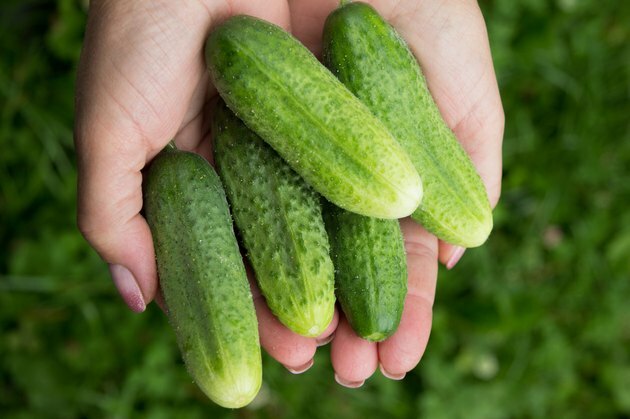 Water the cucumbers to provide 1 to 1 1/2 inches of water during dry periods to keep the burp out of your cucumbers. Cut off the stem ends before consuming your cucumbers. Peel away the skin using a paring knife or vegetable peeler. The skin usually contains most of the burp in cucumbers. Hort Technology: What Are Burpless Cucumbers? Why Do Cucumbers Upset My Stomache? How Do I Cook Sea Cucumber? Do Seedless Fruits Have Negative Side Effects? What Do Cucumbers Do for Your Body?